Over the last dozen or so years, the Cloud Computing (CC) industry has made monumental strides, and there seems to be no shortage of opinions and analysis around the CC solution having huge potential across many applications. In fact, several analysts expect the market to eventually reach hundreds of billions of dollars from an estimated $35.6 billion in 2013. However, market size does not appear to be the question. The pressing issues for the CC industry lie in its security, business adoption/transformation and infrastructure, which will have a significant impact on when that market potential can be realized. Most likely the key concern preventing Cloud Computing from reaching its full, untapped potential is data privacy and security. For starters, the lack of control that users have over where their data is stored has played a major factor in the adoption of CC. Per the definition, CC depends on users doing all their computing over the Internet, and that level of Internet computing with private business and personal information creates a lot of exposure and, in turn, vulnerability. So, storing highly sensitive information on a cloud-based software is too risky for some businesses. In addition, despite legal ramifications if such data is compromised, business' IT departments must be extremely well-versed in encryption methods and security procedures. Because of the uncertainty surrounding CC's security, particularly for its business adoption, much improved cyber security solutions and tools are needed before the masses adopt CC to the extent it could potentially be embraced. For more information on cloud computing security, click here. Determining scale of business and budget capacity can help companies adopt the CC option that best suits their needs. For more information on what to consider when adopting cloud computing for B2B businesses, click here. Lastly, in order for the majority to adopt CC, the storage, capacity, bandwidth and transfer rates of the Internet have to be significantly upgraded to handle the increased load of broad adoption of CC users. In addition, a number of existing infrastructures use commodity hardware that is known to fail unexpectedly. Even a small amount of unreliability can be critical for businesses. However, this need for infrastructure improvement will bring about positive changes as resources will be needed to reinforce data centers, which will result in job creations and improved technology. Irrespective of these hurdles to adoption, it is not a question of “if” Cloud Computing will take-off and reach new potentials, but it is more of a question of “when.” Luckily, the "when" will certainly be accelerated by the resolution of these hurdles. 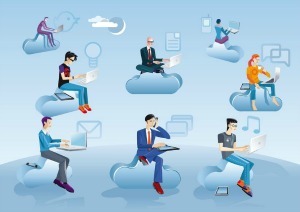 Looking for more information on the Cloud Computing industry? Download our free white paper.